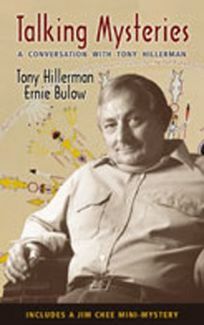 Originally self-published in somewhat different form as Words, Weather, and Wolfmen (1989), Talking Mysteries: A Conversation with Tony Hillerman, by Tony Hillerman and Ernie Bulow, will delight all fans of the creator of Jim Chee and Joe Leaphorn. A map of Hillerman country, illustrations by Ernest Franklin and a series of photos of Hillerman at work (or is he just playing solitaire?) lend visual appeal.